Are you looking for some new patio furniture? Would you like something that can hold up well to exposure to the elements, especially rain? Do you need something that will look great while still being functional? If so, we’ve got you covered! Below, we’ve got five of the best rain-resistant patio furniture sets on the market today. You’ll be able to find something that will look great and become an important part of your backyard setup for many years to come. But what should you plan on buying when you shop for something like this? What type of materials are you looking at when you want the best outdoor furniture for rainy weather? In short, you need to be looking at products made of resin wicker or powder-coated steel. 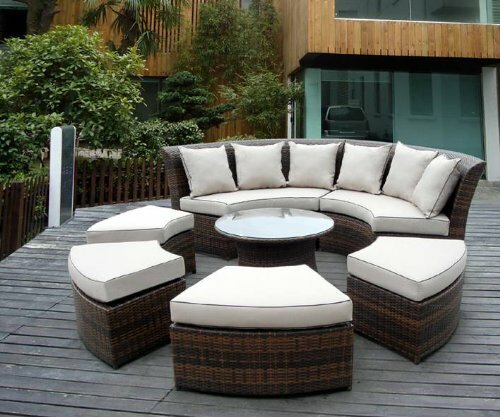 You should also choose polyester fabric cushions whenever possible. Take a look at our list below and find the best option for your patio! This Keter Rio 3 Pc All Weather Outdoor Patio Garden Set is just waiting for you to bring it home and see what a difference it can make in y our patio setup! Available in two different colors, this set is made of molded rattan and is designed to be rustproof as well as waterproof. It comes with two comfy chairs and a small table for holding drinks or snacks. This is one of the most popular small patio set options on the market today. This set can be put together in just a few short minutes with very little effort. Some customers have had trouble getting the furniture to line up properly when assembling, but this is rare. The chairs may be less comfortable than some of the others listed here. 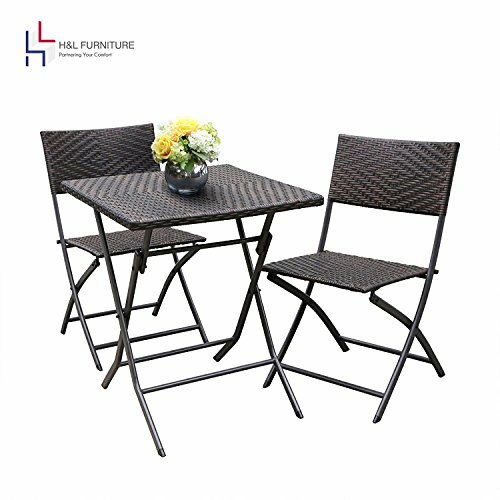 When you’re looking for a smaller set to work on an apartment-sized patio, you need this sturdy H&L Patio Resin Rattan Steel Folding Bistro Set. 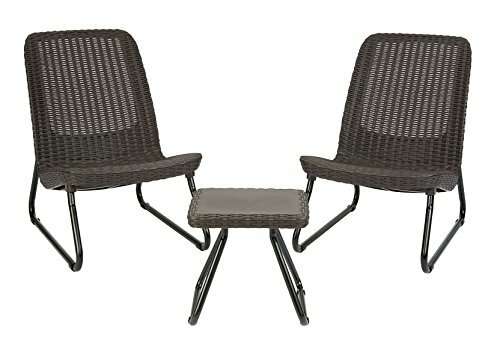 Perfect for two people and less space overall, this set is made with a steel frame and resin wicker accents to make it look great and last a long time, too. Fold up the chairs for easy storage during bad weather or just leave them out—they’ll be fine either way! This set is designed to be rustproof and very easy to keep clean. The set comes in a nice dark brown color that goes well with almost any backyard decor. Some customers have reported the screws falling out of these pieces easily. This set may not be capable of holding as much weight as some of the others listed here. 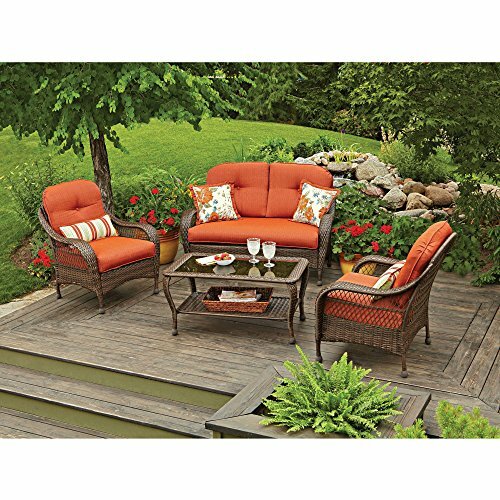 Kick back and relax all year long on this Patio All Weather Outdoor Furniture Set. This set is made from sturdy resin wicker and comes with a loveseat, two armchairs, and a small coffee table. The brown wicker is offset nicely by all three color options with this set, so you don’t have to feel too limited by your choices when you’re trying to decide which one to go with. This is an excellent mid-priced patio furniture set that will hold up well against all sorts of weather situations. This product arrives without any shipping damage or missing pieces most of the time. The included hardware is made of metal and is sturdy and durable enough to last many years. Some customers have had trouble with the screws stripping when installed too tightly, so be careful when assembling. This set is not as large as some of the others listed here. 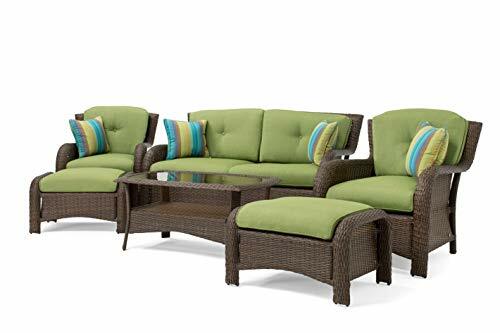 Choose the La-Z-Boy Outdoor Sawyer 6 Piece Resin Wicker Patio Furniture set to get yourself started enjoying your outdoor space without ever having to worry about rain damage again. This set, available in either a soft sage green or a vivid red, includes two armchairs with two separate ottoman pieces, a coffee table, a loveseat, and comfy pillows. The coffee table also features a built-in shelf to give you a little more space to work with when it comes to your outdoor decorating. This is a very sturdy set that comes from a well-known brand name committed to product excellence. The included cushions are all in good condition and hold up well to a lot of use. The wicker on this set may wear out sooner than some of the others listed here. The set may be too lightweight and could blow around during inclement weather in some situations. With the Genuine Ohana Outdoor Patio Wicker Furniture set, you’ll be able to decorate your patio with some of the best and most beautiful rain-proof furniture available on the market today. This elegant set is made out of PE resin designed to look like traditional wicker and comes with two loveseat pieces, a coffee table, and four ottoman style seats. You can arrange these pieces in any way you want to achieve the look you’re going for on your patio or terrace. This is a very popular set that many customers have been pleased with. The furniture is lightweight enough that rearranging it is not too much of a challenge for most customers. The included ottomans do not have backs at all, so they may be less comfortable as seats than the low seats are. The covers on the seats may wrinkle up easily, especially with regular use. Non-weatherproof fabrics. Be sure you’re buying cushions that are made of waterproof fabric or that can be replaced or covered easily. Untreated wood. This is a recipe for disaster when used in humidity or in the rain. Materials that mold easily. Any type of fabric, wood, plastic, or anything else that may mold easily should be avoided for outdoor use. Keep these tips in mind and you’ll be able to select a great set that will make your patio a comfortable place to kick back and enjoy yourself at any time of the day or night—and any time of the year, too!